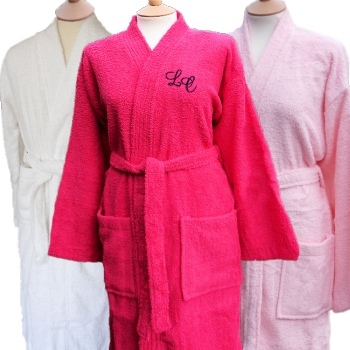 Hot Pink terry cotton bathrobe embroidered with a name or initials of your choice. Hot Pink terry cotton bathrobe embroidered with a name or initials of your choice. Lightweight robe with tie front waist belt two pockets and long sleeves kimono style. Made from soft super fine terry cotton fabric. Hot Pink terry cotton bathrobe embroidered with a name or initials of your choice. Lightweight robe with tie front waist belt two pockets and long sleeves kimono style. Made from soft super fine terry cotton fabric. Fully machine washable and air dry or tumble dry on low.